Gen Xtinct: "A Different World"
Show spinoffs have to rise and fall on their own merits. Some, like "Laverne & Shirley" and "Mork & Mindy," pulled in their own audiences and did well. Others, like the "Alice" spinoff "Flo," (KISS MAH GRITS!) just don't sell. As a white suburban kid, I had little to no knowledge of historically black colleges before watching this show. 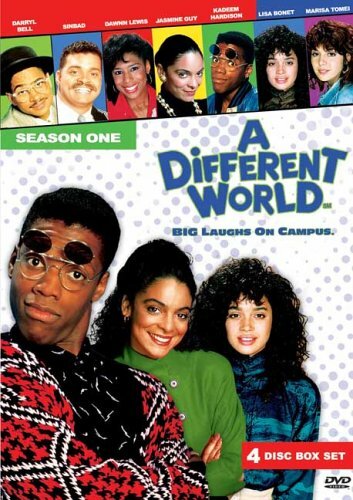 And while it was no "Cosby," "Different World" was addictive, thanks to Jasmine Guy and Kadeem Hardison. It was a little more issuey than "Cosby," and sometimes got preachy, but the characters were fun. Denise Huxtable quickly faded from prominence thanks to Lisa Bonet getting pregnant and being dropped to recurring-only roles (that baby is now singer Zoe Kravitz, 21). If you remember, Denise began the show with some white friends, including Marisa Tomei, but those characters quickly fell away after the first season and the show focused on depicting the black community. Things like mammy dolls, college step teams, the L.A. riots and more were worked into the show. Tupac Shakur, Lena Horne, Billy Dee Williams, Leslie Uggams and Diahann Carroll all played roles. It was a fascinating show for social reasons as well as comedy and sitcom ones, but it also had its own supercouple of sorts -- Whitley and Dwayne. The southern belle Whitley (and when had we ever seen a black southern belle on TV before?) and goofy geeky Dwayne made a novel couple, and when he busted up her wedding, "The Graduate" style, it seemed only natural that they wed. But of course the show slipped after that -- you can never let your main lovers be happy -- but "A Different World" was fun while it lasted. I normally hate storylines where someone is left at the altar, but I love Dwayne busting up Whitley's wedding (to Joe Morton!). He just goes for broke. And Diahann Carroll and Patti LaBelle were perfectly cast as Whitley and Dwayne's moms. Bizarrely enough, Whitley and Dwayne WORKED. So points to the show for pulling that off. Go figure! I loves that show! It was a show about kids in college, so it was like this fantasy world to my high school self. The show got better when Denise left, & Whitney was given more depth.